At the Cranwell RAF Association Christmas lunch the members had several guests from the Sleaford Air Training Corps to recognise the ATC’s help during the year. 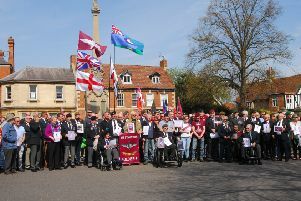 It also gave an opportunity to thank the staff members of the Cranwell Warrant Officer and Sergeants’ Mess. A Branch Thank You Certificate was presented to Cadet FS Alex Myers for carrying the Branch Standard at the Remembrance Service Parade in Sleaford. As 2016 is the 75th anniversary of the ATC, a torch, similar to the Olympic Torch, travelled from the North Scottish Islands to Cornwall. There was a major event at Cranwell College where Cranwell branch members were impressed by the displays and parade by cadets. The branch committee donated a miniature torch to their adopted Sleaford ATC Squadron, presented to the ATC Commanding Officer Flt Lt Dave Peacock.